Object. 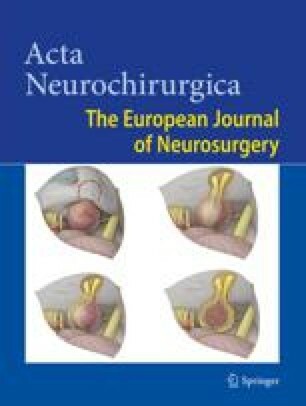 Treatment of esthesioneuroblastoma (olfactory neuroblastoma) has been considerably improved by microsurgical techniques. Nevertheless, these rare tumours of the frontal skull base are still associated with high rates of tumour recurrence and mortality, thus remaining a challenge even for experienced surgeons. A novel therapeutic approach that combines endoscopic sinus surgery and Gamma Knife radiosurgery is presented here. Taking into account the rarity of the disease the present study comprises a relatively large series of patients treated in a similar manner. Methods. 14 patients (8 males, 6 females) aged 27–75 years (median 38) were treated between May 1993 and December 2003. This series comprises 12 newly diagnosed esthesioneuroblastomas. Two more patients had already previously undergone surgery (24/39 months earlier). Paranasal and nasal endoscopic sinus surgery was performed. Marginal irradiation doses ranging from 15–34 Gy were given to the residual tumours by means of radiosurgery (Gamma Knife) involving 1–7 isocentres within 3 months after surgery. Median follow-up is 58 months (range 13–128). Results. There was no mortality. In all patients tumour control was achieved within the treated area. 4 patients underwent a second radiosurgical procedure 6–79 months (median 34 months) after initial radiosurgery. One patients had to undergo an additional craniotomy because of extensive neoplastic infiltration, 1 developed postoperative liquorrhea, 1 case was complicated by bilateral frontal sinusitis. All patients complained of nasal discharge and crusts. Karnovsky Index – preoperatively ranging from 80%–100% – remained stable in 12 patients, an improvement was observed in 2 cases. Conclusions. Based on the favourable results recorded so far, the combination of endoscopic sinus surgery and radiosurgery can be considered a promising treatment option for esthesioneuroblastoma that merits further consideration. Keywords: Endoscopic sinus surgery; esthesioneuroblastoma; olfactory neuroblastoma; stereotactic radiosurgery.